Local news, weather, and investigative stories impacting the community. A storm moving into San Diego County from the south brought thunder and lightning to the South Bay early Monday. 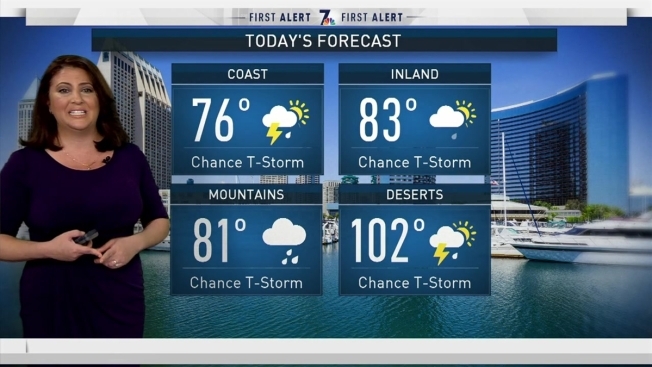 “In the South Bay, people are hearing the loud ‘Boom’ of thunder,” said NBC 7 Meteorologist Jodi Kodesh before 7 a.m.
“This thunderstorm may even produce hail,” Kodesh said. By noon, many communities in the East County and South Bay reported not only thunder and lightning but rain. Most of the heavy rain was concentrated in the mountains with more than half of an inch falling on Mount Laguna. Alpine reported approximately a third of an inch. NBC 7 users shared what they experienced through our Facebook page. Caitlin Renton said she was out running in Linda Vista when she saw the lightning. "Looked like it was over downtown or ocean! Crazy!!" she posted. Several people commented that there was rain in Tijuana, Mexico. Nancy Mora told us she was hearing thunder and seeing lightning in Pine Valley. Join the conversation on the NBC 7 Facebook page. Download the free NBC 7 mobile app and make weather your start screen to stay updated on the storm.